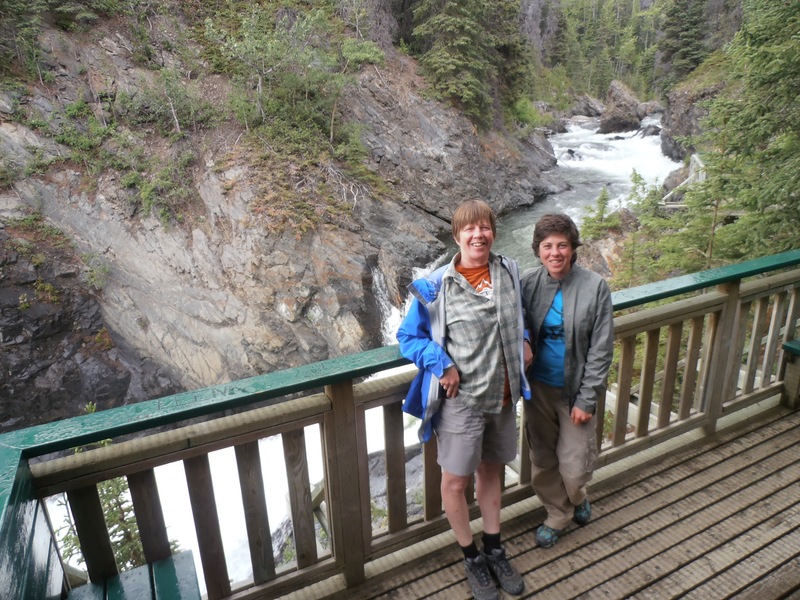 Getting to The Yukon Territory made me feel a little giddy at first. Like Alaska, it is a place that had the ring of being so far away. The world is so largely connected now that perhaps it is unnecessary to feel that way about places on the same continent, attached by easily driven roads to the place I’d started. A thing about biking to places is it is a little silly. It isn’t a way to get to a far away place, I’m finding it is a way to bring those places to me. Nowhere feels impossibly far away to me right now. I’ve made an effort to slow down a little, I don’t have to worry about time right now. 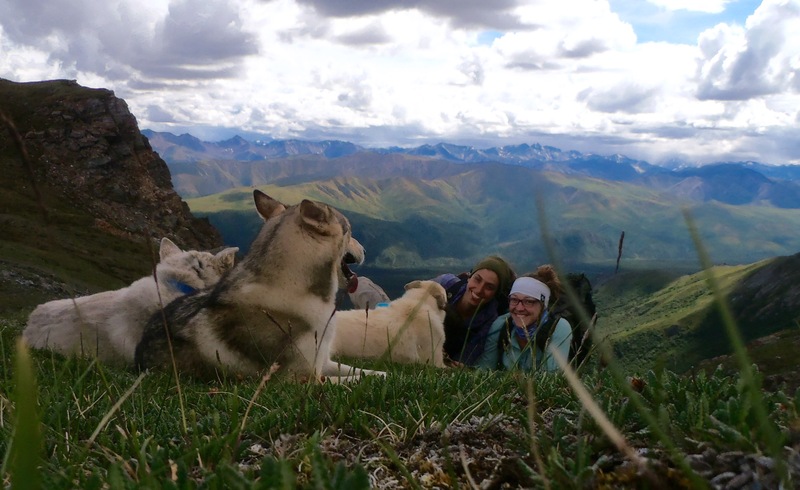 Slow down, don’t forget to enjoy this, says the Yukon. Even if you can’t see or breathe well, Alaska adds. I have taken some time to plan the next while out. Summer will have less biking perhaps than spring proportional to distance I expect to travel, and this chunk does have a more firm destination date. I look forward to plenty of exploring, visiting, and whatnot in the coming months. 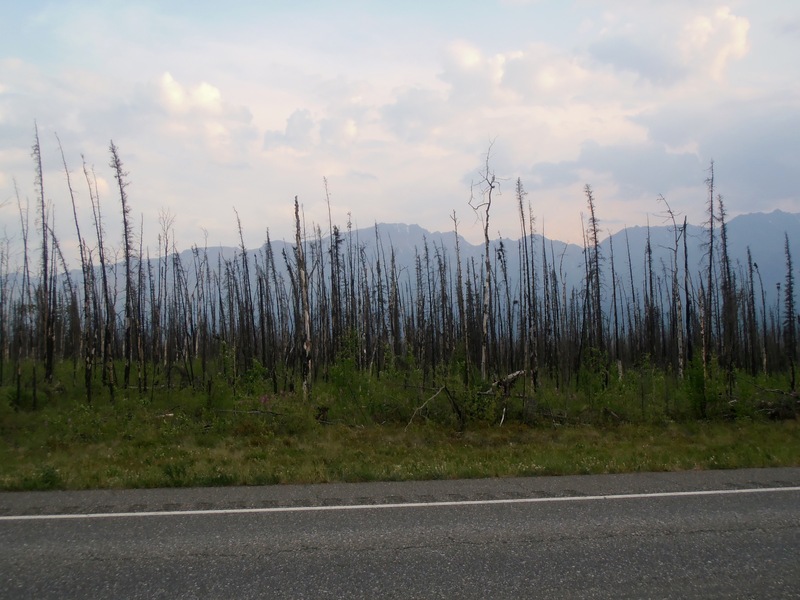 The Alaska Highway management changes at the province/territory line, and of course again at the national boundary, and there were a few notable (if not really so interesting that I should write about them) differences. 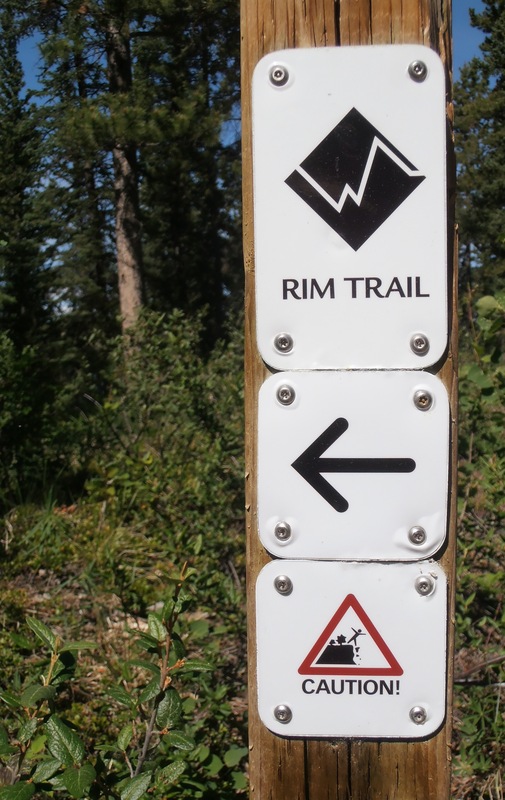 BC had markers every five km, Yukon tells you where you are every two, and Alaska every mile. Along the road in Yukon are a lot more rest areas (A rest area is kind of like a trash pull out, but with outhouses and sometimes maybe a picnic table and an interpretive display)in Yukon. 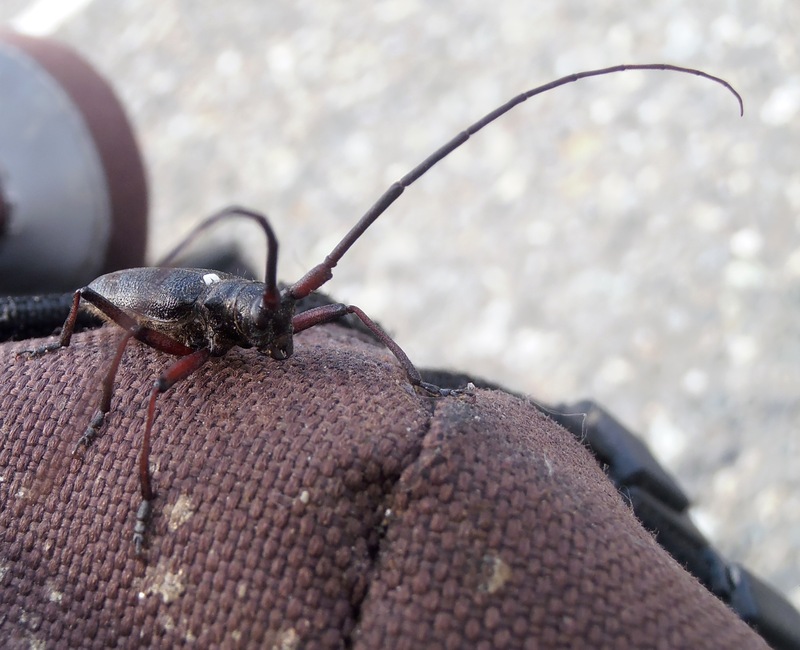 I think I saw one in BC, and it had a note on the sign that the next was in ~350km, so after you leave BC. After that they could be found every 20-70km. 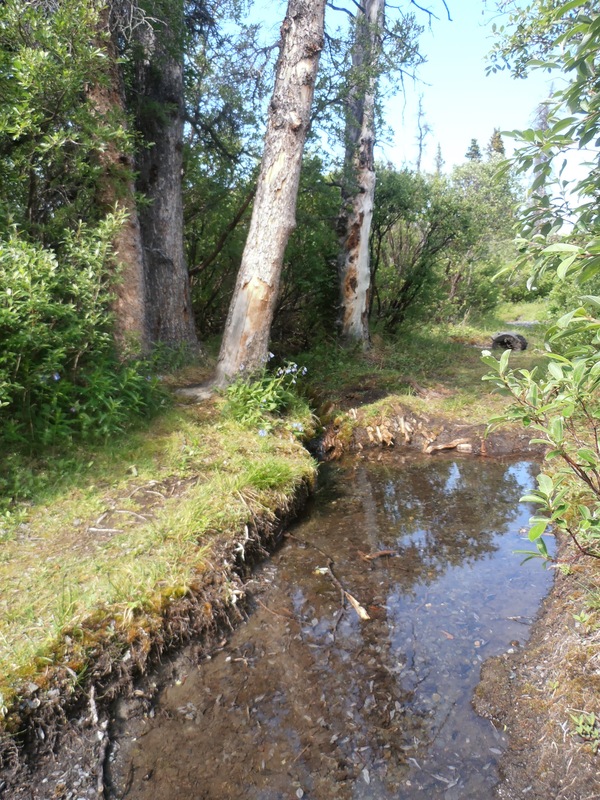 These, along with the government campgrounds and recreation sites, often made good places to take breaks. Not essential or anything, just comfortable. 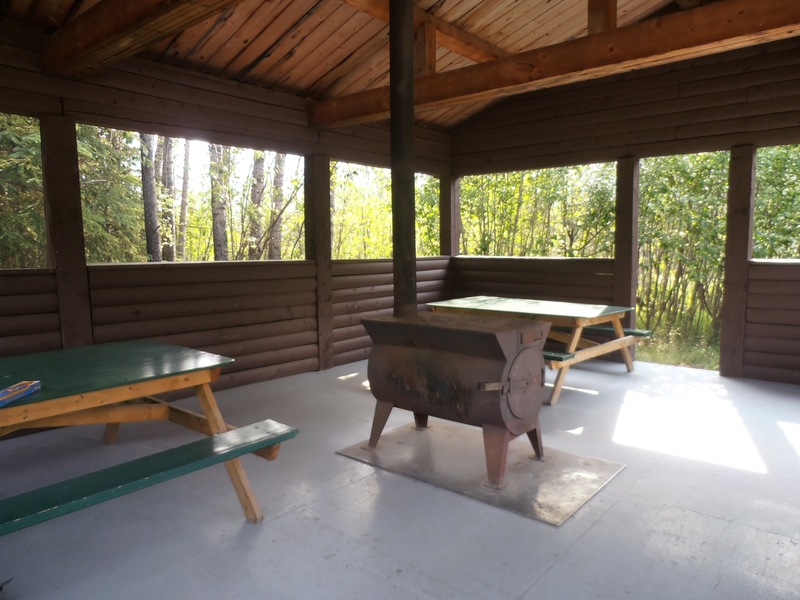 Many Yukon campgrounds and recreation areas had cooking shelters and wood stoves, and wood. I always used my own stove, but it is nice they are there. Side note, I have two 650mL bottles of fuel I packed for my stove and just got into the second when I got into Alaska. Whitehorse was a welcome break. It was the first city I’d come to in a while, and I was really feeling like I needed to get off my bike. I got to Megan and Ross’s place Thursday evening, put my bike in their basement, and didn’t touch it for two days as I walked around the small downtown area, got to know the town a bit and learned some Yukon history. I was at this point one day behind my estimated schedule laid out before I left. I had left Edmonton a day later than I had planned, and I’m not sorry about that. If I left Sunday, there was a chance I would reach Fairbanks by solstice, an arbitrary initial goal I had. But I didn’t need to do that. I acknowledged that it didn’t matter and instead I hiked around Miles Canyon and had a chance to cook food to share and hang out with Megan and Ross a bit. This was the most recommended place to go in Whitehorse. I stopped suddenly on the side of the road, a bit past the turn off, to reconsider riding north to Dawson, but after a bit decided to keep heading west. It doesn’t matter much, one choice or another, I’d have met different people and seen different things. As I rode that evening a man in a car pulled over to tell me about a good camping spot, a section of the old highway that is worth detouring on, and invited me to help set up for a big anual bike race that goes between Haines Junction and Haines, AK. Mark gave me his phone number and told me where to meet. As I approached Haines Junction the following day this seemed like an ok thing to do. 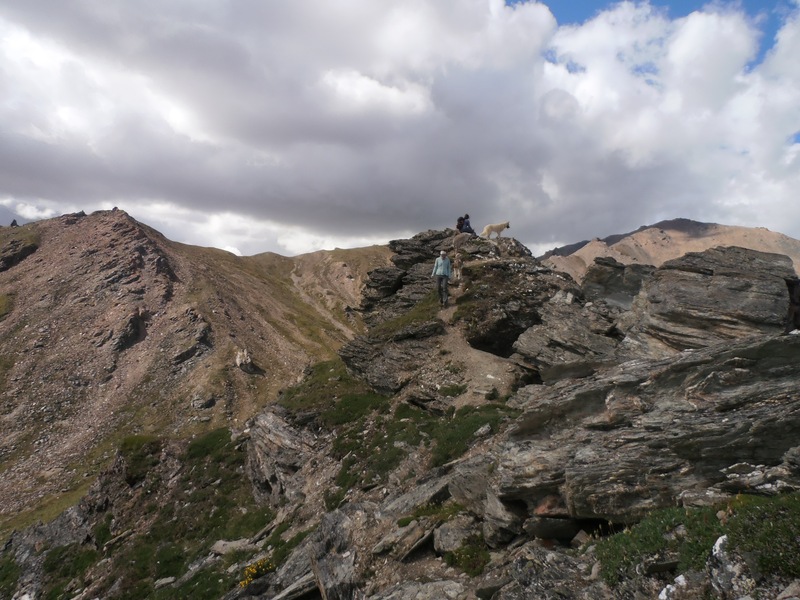 I stopped at the Kluane Interpretive Center and got hiking advice and managed to borrow a little backpack. I hung out at The Village Bakery and set out in the morning. I felt good about taking a day off the bike to hike, and helping set up for the race gave me a chance to see a ways down a road i wouldn’t have traveled otherwise. Most of my hike was pretty wet, on and off rain, wet plants brush against my pants. In the afternoon, though the sun came out and everything looked and smelled a bit different. This picture may not capture how pleasant this little spot felt. 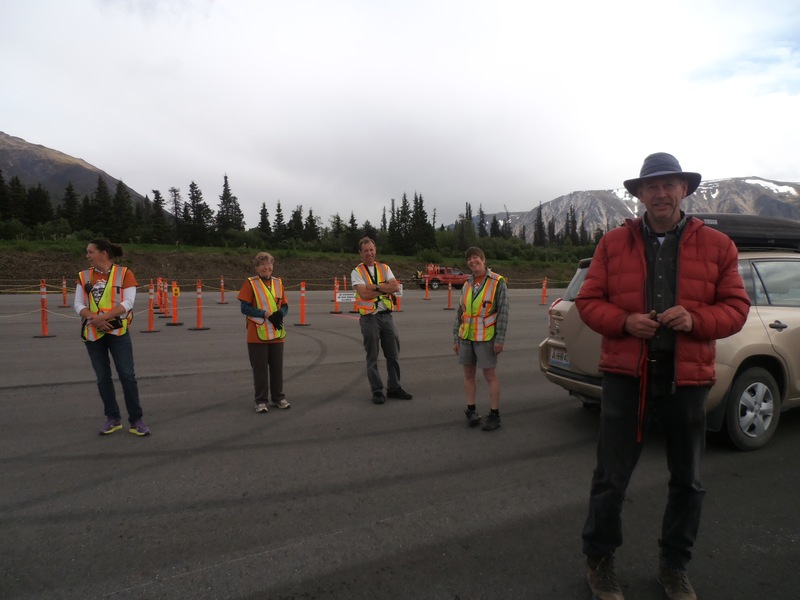 Here are some folks and a checkpoint we set up! Between stops Mark and Marty would take me on excursions to see some sights. Here my new friend Marty and I are at Million Dollar Falls, perhaps named for the value of equipment lost there. 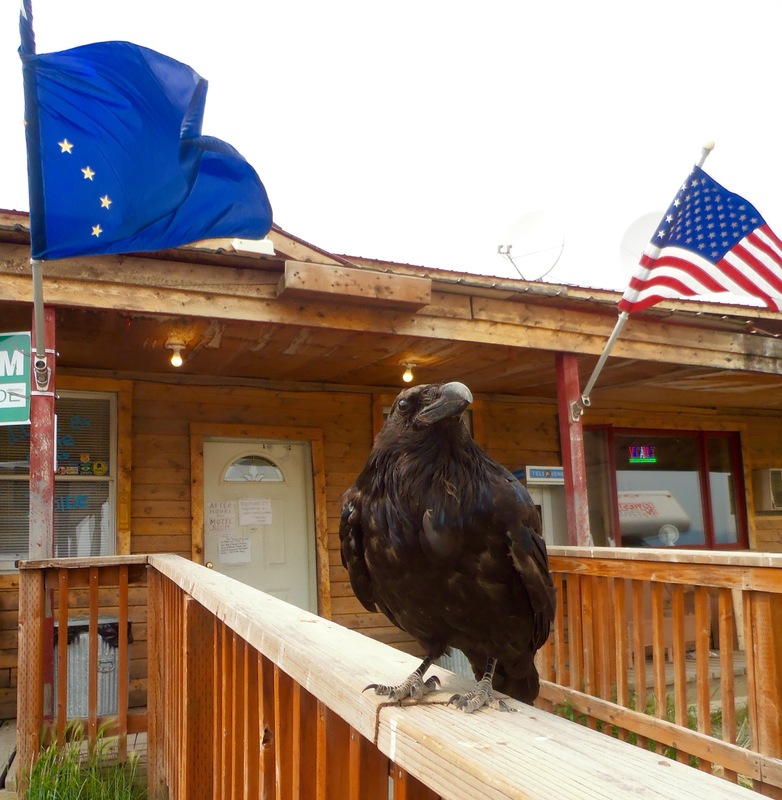 I like Haines Junction. I met some great people there. I met a person working at the other Kluane visitor center who came to stay five years ago after first visiting Yukon on a bike tour! After my break in Haines Junction I stopped in Burwash Landing. I read there about fires and woke up the next morning to smoky skies, which got thicker as the day went, and more the next. (I might have been alarmed by this if I had realized it was smoke earlier in the day, but it was thin enough at first I mistook it for clouds). The following morning I came on road work and the crew ferries bikers through so I had a while in a car with a person. Where is the smoke from? Oh, Alaska is on fire. There are hundreds of fires burning across the state. She dropped me in Beaver Creek. I hung out at the visitor center for a bit and got to visit Sid’s museum-antiques he’s been collecting since the 60s and started building structures beyond his house to support in the 90s. There is 30km between the Canadian Customs stop just past Beaver Creek and the American Customs. No hassels at this border crossing. The guy asked such leading questions as, you don’t look like you’ve got room to have bought much other than food in Canada, is that right? I said yes, though I think I could have gotten other things if I’d wanted to. I will admit to feelings as I entered Alaska. 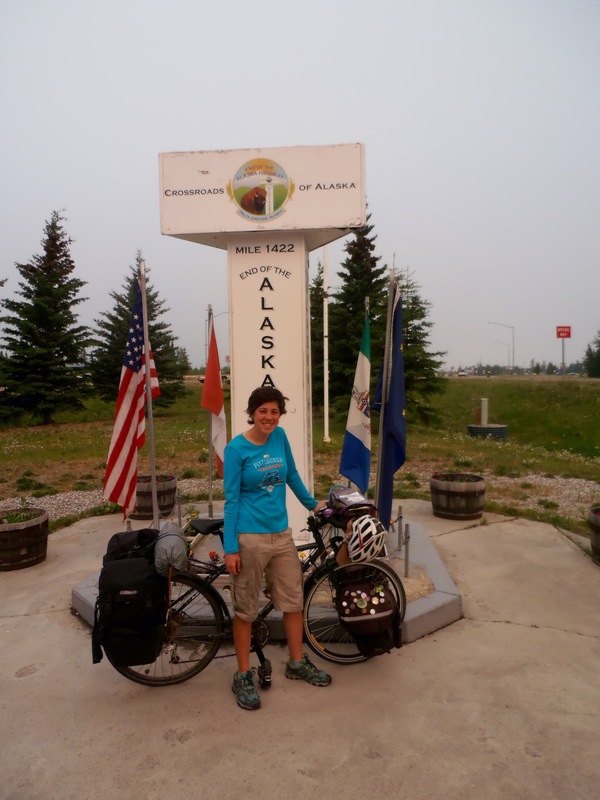 I said I wanted to bike to Alaska and I did, some of this feeling was relief, I’m sure, that I had done a thing I had admitted to other people I was attempting to do. Though that border was no destination, even now I’m not done traveling, I feel a bit less concerned about judgement, which is of course absurd to worry about anyway. Anyway, it is a somewhat arbitrary line, and interior Alaska is not so different from interior Yukon, except there are a lot more people this side of the line. So long Alaska Highway! I’ve gotten a little less shy about asking folks to take my picture. This guy had actually asked to take a picture of me, impressed by my travels, I guess, so it was an easy request for me to make. 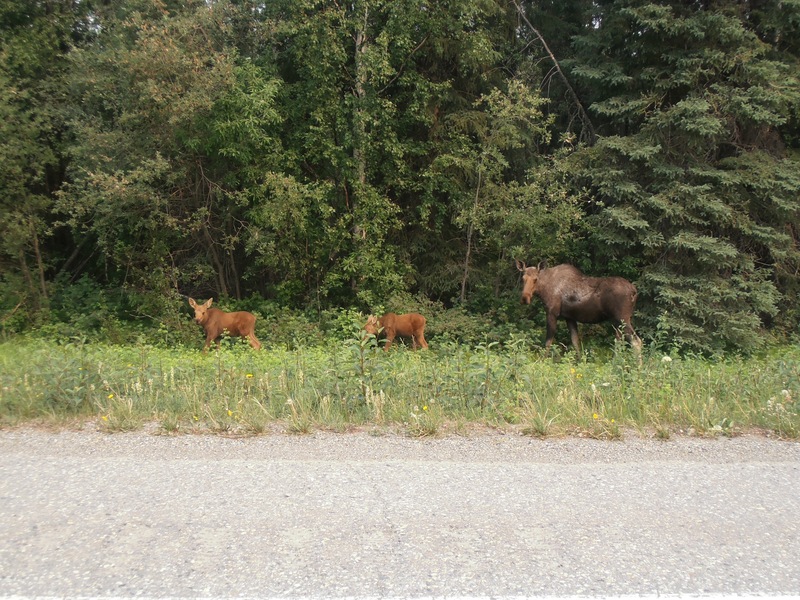 These moose had gathered quite a crowd of highway onlookers. They remained tollerant, everyone stayed just far enough off to avoid her concern, at least as long as I lingered. 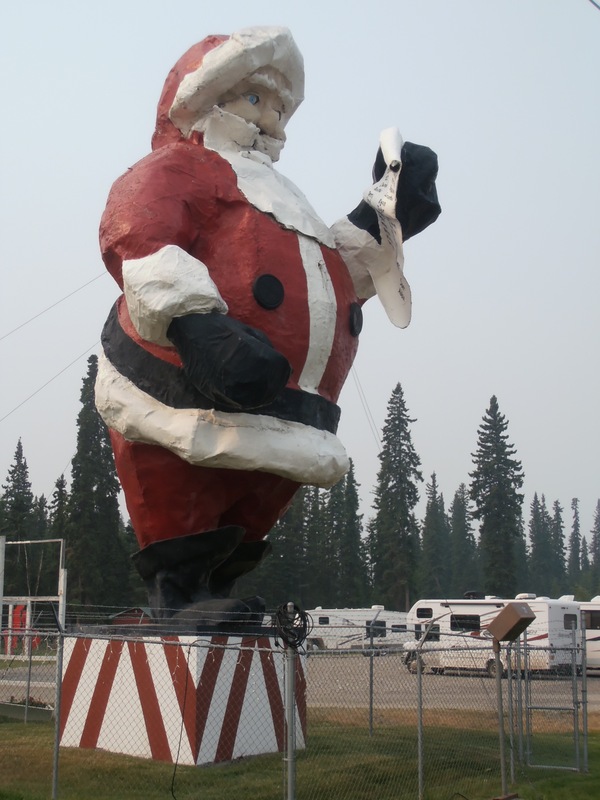 This absurd, huge Santa figure looks over his list from his perch in clear view of the highway in the Christmas themed town of North Pole. And then into the Golden Heart of Alaska. Smoke was pretty bad by then, and it was good to know I wasn’t going to be doing much riding for a few days. 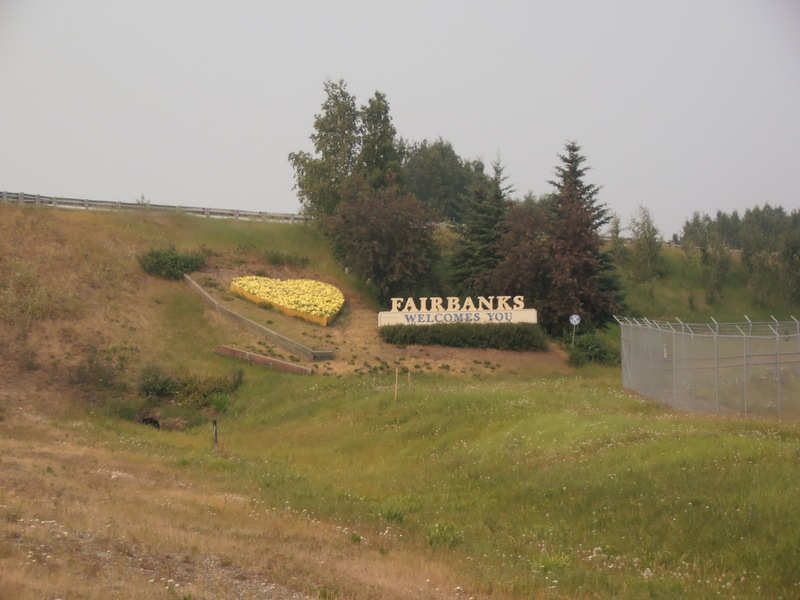 I got into Fairbanks Thursday. I met up with Portia, who I would stay with. I wandered, met some other people, listened to music and ate things. Saw some smoke covered potentially lovely views, got wet in the rain, got a new tire. Saturday evening I made dinner and Portia and I drove down to Denali. She’d been planning to go to see a friend’s band play a show, and I decided to tag along. We’d camp and hike and then I’d continue on from there, not feeling like I’d missed much in the 120 miles, glad to get to clear air. The show was fun, I met a bunch of Portia’s friends, and the camping spot was lovely. A late night and a slow morning, then four of us set off to hike Mt. Healy around noon. There is another trail from the other side of the mountain that we hoped we could hook up with, rather than doing an out and back. Sarah turned back mid-afternoon, having plans in town that evening, and the rest of us, and three dogs (not legal where we started, fine where we were heading) continued on, excited to explore, and prepared for a long day. Ended up a bit longer than we were hoping for, with some strong winds, hail, treacherous climbing, wrong turns and stubbornness… around 10pm we conceded that we were not where we wanted to be and rather than continue trying to make it work we really needed to turn back and go the way we came. The views were amazing from up there, and I think that (at least at points, and especially once we were back on the trail) I genuinely appreciated the overnight hike. If you are going to make mistakes that lead to hiking until 5am it is good to do it in a place that never gets dark. The colors of sunset and sunrise a couple hours later were lovely. 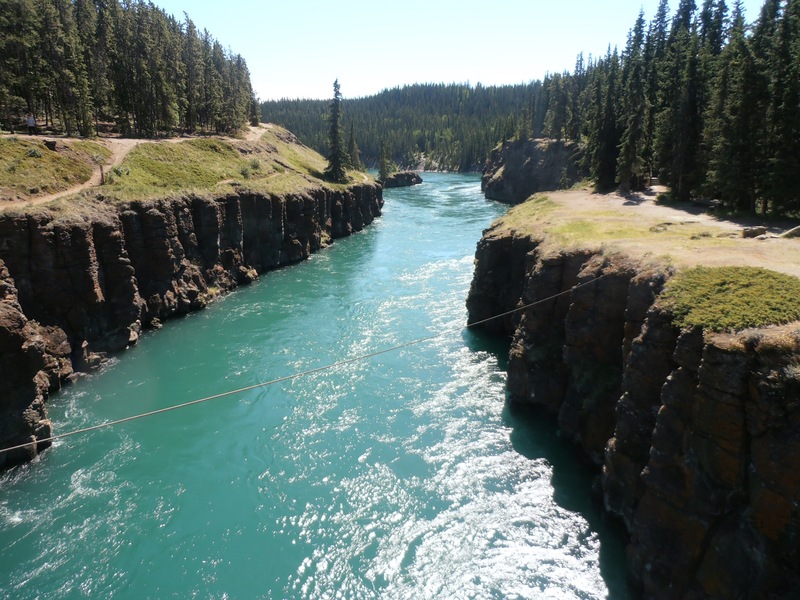 The Nenana River snaking through the valley was a gorgeous sight we only caught on the way back. The sky was clear and we could see the moon over the mountains, hanging huge in the slightly dimmed sky. When we were back on the trail that mostly continued back to the maintained trail we were rewarded with a clear view of Denali. We made it. Had a little feast in the parking area by the car, and the dogs passed out. I came back to Fairbanks with them, where I’m taking a couple days to recover from that adventure… at least the smoke has cleared a bit! we used the timer on the camera for this and I ran over. Cori pulled me closer and I rolled a bit out of control, my face at her level, Sheba took the oportunity to lick my face. 5 Responses to Hey North! Reading these posts at work makes me so jealous, I’m glad you’re having lots of adventures and thanks for setting up the bike race for all of us! Let me know when you’re hopping the ferry south!